aiT was designed in the IST project DAEDALUS according to the re­quirements of Airbus France for validating the timing behavior of criti­cal avionics software. The results obtained on the topic of WCET, and the improvements of the AbsInt tool is one of the most important achievements of the DAEDALUS project, from both technical and industrial points of view. […] aiT is probably the best of its kind in the world, and it is justified to con­sider this result as a breakthrough. The comparison shows that the WCET [computed by aiT] typically is about 25% higher than the measured time for the same task, the real but non-calculable WCET being in between. Another comparison is worth to mention: the one between aiT’s results and those of Airbus’ traditional method. As predicted when the decision for using aiT was made, the figures obtained by the traditional approach are a lot higher than those produced by the aiT-based method. Ac­tu­ally the overestimation is such that the traditional figures are useless. Among other things, aiT was used by Airbus to validate the timing behavior of all tasks of the flight control software of the A380, the world’s largest passenger aircraft. The analysis was per­formed on the ground as a critical part of the safety certification of the aircraft. In 2003, AbsInt was awarded a European Information Society Technology (IST) Prize for aiT. The IST Prize is the most distinguished award for “groundbreaking products that represent the best of European innovation in information society technologies”. In 2006, aiT participated in the first WCET Tool Challenge, organized by University of Mälardalen and sponsored by the ARTIST2 Network of Excellence on Embedded Systems Design. The aim of the WCET Tool Challenge was to inspect and to compare different approaches in analyzing the worst-case execution time. All available tools and prototypes able to determine safe upper bounds for the WCET of tasks have participated. aiT was the only tool that started for 3 different real processor architectures. It was the only tool that was able to produce results for all test programs. The results of analyses by aiT were in most cases exceptionally precise. Finding in the challenge was, amongst others, that aiT allows for user-friendly WCET analysis, advises against unrealistic annotations, and provides tight WCET values. aiT was able to handle every kind of benchmark and every test program that was tested in the Challenge. aiT is able to support WCET analysis even for complex processors. […] aiT dem­onstrates its leading position through all its features, which contribute to its position as an industry-strength tool, satisfying the requirements from industry as posed by EADS Airbus and proven by the accomplishment in various projects. In 2010, aiT was used by NASA as an industry-standard static analysis tool for demonstrating the absence of timing-related software defects in the Toyota Motor Corporation Unintended Accel­eration Investigation. aiT has been used in various international industrial and research projects. 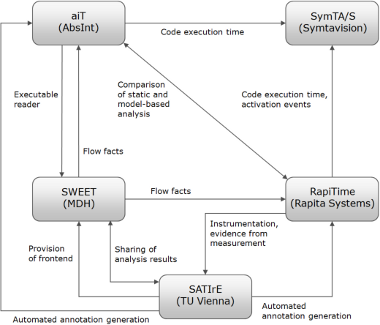 For example, in the ALL-TIMES project, aiT was integrated with several other timing analysis tools into a single development framework. Airbus Operations S.A.S has estimated that its use of the INTERESTED tool chain resulted in a 48% reduction in overall project effort […]. Thales reported that the rigour imposed by the use of model-driven tools compared to freeform alternatives resulted in a 25% reduction in overall project effort […]. Siemens Mobility reduced overall projects costs by 20% […]. Focusing on overall development effort, the Commissariat à l’Energie Atomique et aux Energies Alternatives estimated that […] initial development costs were reduced by approximately 40% and 69% for on-going maintenance costs. Magneti Marelli stated that […] a 50% time saving, and possibly more, could be made by applying the INTERESTED tool chain. Most recently, aiT has been integrated into the SCADE Suite, the mar­ket-leading mission and safety-critical embedded software de­vel­op­ment environment from Esterel Technologies. SCADE is the only model-based design solution to offer DO-178B qualified C code gen­er­ation up to level A, certified IEC 61508 C code generation up to SIL 3 and certified EN 50128 C code generation up to SIL 4. Thanks to aiT, SCADE is the first embedded-software development environment worldwide to feature WCET analysis at the model level. Saarländischer Rundfunk (TV), “Aktueller Bericht”, October 15, 2007. Saarländischer Rundfunk (TV), “Aktueller Bericht”, April 27, 2005. Saarbrücker Zeitung, April 6, 2005. IDW online, January 17, 2005. Saarbrücker Zeitung, October 8, 2003.